Do lobsters feel pain or fear as we boil them live? Do we really want to know? Musing about hapless crustaceans that are sacrificed daily for the sake of a good bite is probably not the most uplifting way to pass the time. However, I was thinking about a recent visit to one of those restaurants—the kind of place where you point to your desired lobster in a tank, he looks at you (I swear), and half an hour later, you pretend it is a completely different lobster that is served to you. This experience brings to mind a culinary conundrum. 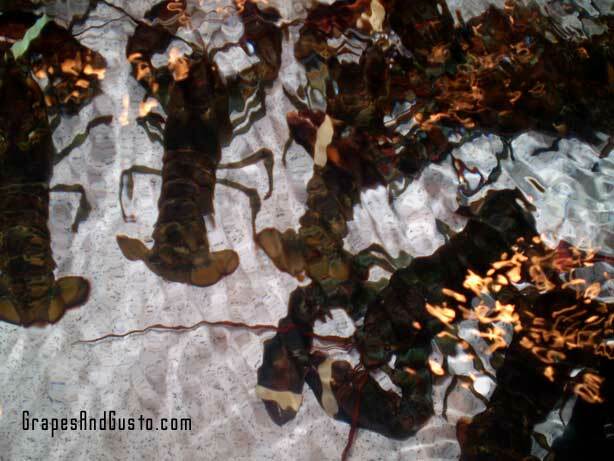 Do lobsters have feelings when they are dropped, live, into a pot of boiling water? Do they know what is happening to them? This scene was played out a bit too comically in the recent, double-bio film, Julie & Julia. The character of food blogger Julie Powell cringed a little while trying to throw a few defenseless lobsters into a boiling pot, got her husband to help her, and that was it. Ha ha, next scene. And I love foie gras, as well, but should I stop eating it because of some unsavory or downright cruel practices used in artificially fattening the birds’ livers? Should we shun veal because of the idea that baby calves should not be pent-up, awaiting our next piccata? What about poor, helpless snails that were just minding their own business before becoming a garlicky plate of escargot? Of course, who’s to say that these dilemmas should be reserved for only the more exotic creatures, or for the more publicized animal-treatment scandals? Do we know that pigs, cows, and chickens do not feel pain, or cannot sense their impending doom at some point in the slaughter houses? This is not about endangerment of species, like in the case of shark fin soup, or even whether our food is prepared safely, like the nouveau urging to avoid chicken from dirty, overcrowded poultry farms. Incredibly, perhaps, but I continue to enjoy my meat, seafood, and poultry; and yes, I did watch the documentary Food, Inc. The solution here is not to simply buy “organic” or “grass fed”—that may solve our health concerns and fight Big Business in the process– but the question I am asking is, do animals feel pain and fear, particularly relating to their slaughter for the purpose of our next meal? And if so, is it or is it not the way of the world – similar to Mother Nature’s world of predator and prey? If we were to apply a perfect argument, we could not draw the line about guilt over some meats but not all meats. If we did categorize these meats with our conscience in mind, would we break them down into staple meats and nice-to-have/shame-on-you meats? And which animals deserve to be assigned into either predicament? In this and a previous blog entry (Goose Liver Ethics), you are to be commended for showing some awareness that the enjoyment of food may have some nasty consequences for the sentient animal, fish and fowl that grace your plate. You asked an important question in the previous blog – “Where does it end?” Gilat, the answer to this important question is in your heart. I could give you reams of research that proves unequivocally the pain and suffering felt by these creatures … but those facts only represent empirical evidence; instead, and probably more importantly, listen quietly and I trust that you will hear the answer from within you. I appreciate your feedback, and most certainly your links! They are very helpful in the perennial research about our food decisions, and in getting to know those who have gone “all in” with their stances. I’m sure there are a plethora of wine selections to pair with cruelty-free, culinary choices with a conscience. However, I am not sure I understand your comment about being considered a “sham,” since I am openly undecided and debating which side of the fence to stick with when it comes to the savor or the sacrifice. I invite you and anyone else to continue to candidly comment and explore this tenuous area, as we each come to our own personal conclusion – based on our own hearts, as you mentioned – about what to eat and drink.